The iNUKE NU6000 will fit comfortably into any standard 19" rack with the rest of your gear. The NU6000 has a "back-to-front" ventilation system and incorporates High-Density Class-D components with "near-zero" thermal build-up, which allows the unit to run cool and avoid the need for massive heat sinks. Each channel has their own independent DC, LF, and thermal overload components that will automatically protect the amplifier and speakers to avoid any damage to your system. The exterior of the NU6000 is manufactured with a sturdy metal housing that secures all of the internal components. The rear panel of the NU6000 has XLR and TRS input connections, and also features professional twist-lock speaker outputs that provide versatile and secure connections for your system. There are 4-segment signal and limit LED's on the front of the NU6000 that help you visually monitor performance levels. 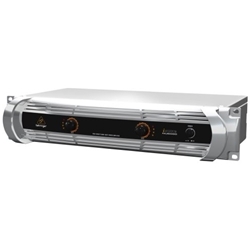 The NU6000 operates in stereo or dual-mono modes, and has a switch-mode power supply that provides noise-free audio with good transient response and low power consumption. The iNUKE series VU600 offers a durable and affordable power amplification solution for your sound system.